Mardome opening domes are available in an opal-tinted glazing to offer increased privacy, softer beams of lights, and minimal solar impact. Opal glazing offers diffused light so that the daylight that streams in is softer and disperses more evenly. The glazing tint also reduces solar glare and heat gain, preventing the room below the roof light getting uncomfortably warm or suffering any damage from UV rays. Why choose Mardome fixed domes? Mardome are a leading manufacturer of domed rooflights, combining functionality and style to create the perfect rooflight for your home. They have been developed specifically for flat or gently sloping roofs of 15 degrees or less, and come in a range of styles and designs to suit you. 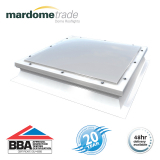 Choose between the Trade and Ultra fixed rooflight collections from Mardome. The trade fixed rooflights are the standard specification, providing a stylish contemporary look combined with good thermal insulation and steep kerb walls to maximise the amount of daylight that enters the room. The Ultra fixed rooflights have a more contemporary low rise profile, and comes in an aluminium frame. Additionally, there is a secret lock system to ensure that the dome can only be opened with the security key.